Which Insect Bites Cause Blisters? What Does a Centipede Bite Look Like? The wolf spider is an aggressive hunter, but is generally shy and will run away when disturbed. If provoked, intentionally or otherwise, the wolf spider may bite out of fear. Wolf spiders are most often seen outside, running across the ground while hunting. They occasionally journey into the warmth of homes when the weather gets cold. Wolf spider bites are painful but not deadly. They can cause serious symptoms in some individuals. There are about 175 species of wolf spiders world-wide. The wolf spider belongs to the Lycosidae family in the order Aranedia. Wolf spiders have large fangs and vary in size according to species, ranging from 1/2 inch to 4 inches in length. They are a hairy spider and usually grayish-brown in color with a stripe pattern on their backs. The majority of wolf spiders do not make webs; they hunt prey (insects, lizards, toads) on the ground, day and night, and live under rocks, earthen debris or soil. Wolf spiders have eight eyes and are extremely fast movers. Female wolf spiders carry their egg sacs, and spiderlings ride on their backs for several weeks while they grow. 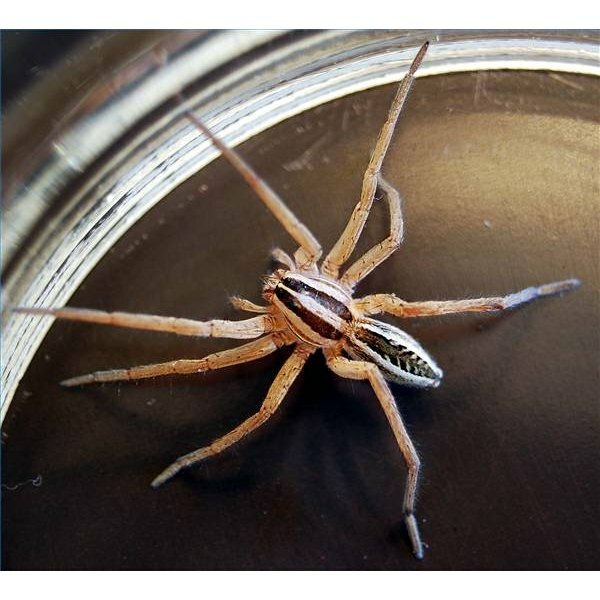 The venom of the wolf spider is poisonous, but usually not overly harmful. Bites cause pain, inflammation, itchiness and tenderness. Lymph nodes may become swollen due to the immune system's defensive reaction to the invading venom. Symptoms can last up to 10 days. Some individuals may experience more serious symptoms such as darkening (necrotizing) of the affected skin, nausea, dizziness or rapid pulse. In these cases, medical treatment should be sought immediately, especially if the victim is a child or elderly. Mild wolf spider bites can be treated at home. The bite should not be bound or bandaged. Wash the wound with antibacterial soap and warm water. Elevate the wound, limit movement and gently place a sterilized ice pack over the bite to reduce swelling. If necessary, consult your physician regarding further treatment such as pain medication, antihistamines or antibiotics. Wolf spiders are sometimes mistaken for brown recluse spiders, whose venom is much more poisonous. Therefore, if your bite symptoms are severe, persistent or worsening, medical treatment should be sought urgently. Aja Rivers is a New England native who has been writing professionally for nine years. Her poetry has appeared in "Tiger’s Eye: A Journal of Poetry," "Main Channel Voices" and "The Aurorean." She has an associate's degree in science from Cape Cod Community College and a paralegal certificate from Gloucester County College. Rivers is also a certified all-breed dog groomer.